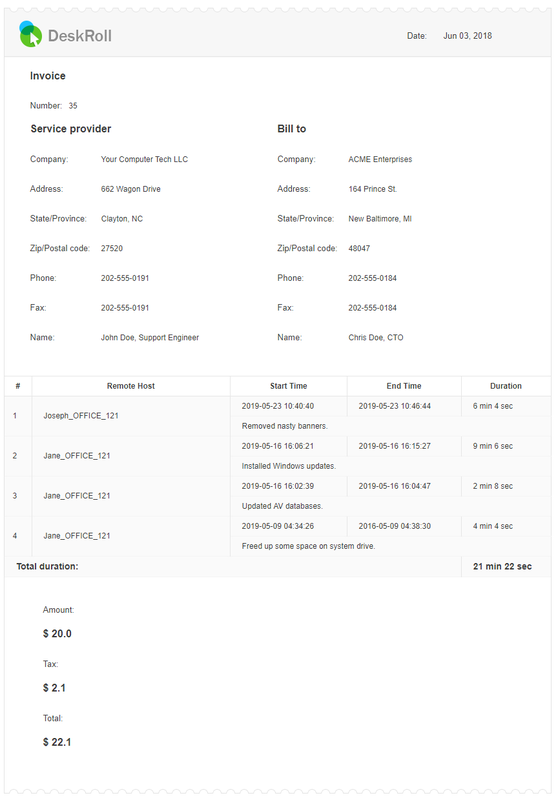 Session logs are handy when you want to invoice your customers for remote support jobs. The information that can be used in invoicing includes host name, session start and end time, duration and comments. You can generate invoices for a single session, for multiple sessions to a specific host or to multiple sessions to multiple hosts included into a group (company). - Click Show: Clients & Computers and select the host. - If there are mutiple sessions grouped under the host name, open session list and find the session. - You can filter displayed sessions by date under Date range. 2. Click Generate invoice on the right from the required session. 3. Enter company details and total amount due, then click Save to PDF to save your invoice. In the screenshot, an invoice for a session to host Jane_OFFICE_121 with comment Installed Windows updates. is about to be generated. 1. Find the sessions by host name by clicking Show: Clients & Computers and selecting the host. 2. Open all the sessions in the list under that host to verify the selection is right. You can filter displayed sessions by date under Date range. 3. Click Generate invoice on the right from the host name. 4. Enter company details and total amount due, then click Save to PDF to save your invoice. In the screenshot below, an invoice from all sessions of host Jane_OFFICE_121 with overall duration of 15 minutes and 18 seconds is about to be generated. This feature is useful if you have customers with multiple remote hosts. 1. Make sure you have assigned the hosts to a group. 2. Let us select the required sessions on the Logs tab. - Click Group by client. - In the session list, open the required group to verify the selection is right. You can open host in the list to see sessions under each host. - If necessary, limit sessions by date under Date range. 3. Click Generate invoice on the right from the group of hosts. - From here you can also generate invoices for specific hosts or sessions: simply click Generate invoice on the right from a host or a session in the list. In the screenshot company/group ACME includes hosts Joseph_OFFICE_121 and Jane_OFFICE_121. The Generate invoice link in the screenshot will start invoice generation for all sessions of both hosts belonging to ACME.